This week, the Literary Review of Canada published my and Taylor Owen’s review of When the Gods Changed: The Death of Liberal Canada by Peter C. Newman. For non-Canadians Peter Newman is pretty much a legend when it comes to covering Canadian history and politics, he was editor of the country’s largest newspaper and main news magazine and has published over 35 books. I also think the review will be of interest to non-Canadians since I think the topic of the decline of Liberal Canada are also true for a number of other countries experiencing more polarized politics. In Athens, ever-increasing popular participation in politics led to rule by demagogy. And in today’s America, money is now the great enabler of demagogy. As the Nobel-winning economist A. Michael Spence has put it, America has gone from “one propertied man, one vote; to one man, one vote; to one person, one vote; trending to one dollar, one vote.” By any measure, the United States is a constitutional republic in name only. Before getting serious on you again, here’s a lighter more interesting note. I often comment in talks I give that real estate agents rarely use data to attract clients – mostly just pictures of themselves. Turns out… there might be more data in that then I thought! Apparently less attractive agents sell homes faster and work harder. More attractive agents take longer, but get more money. Food for thought here. Another oldie but a goody. Liberal Canada may be dead, but it appears that Conservative Canada isn’t in much better shape. I’ve always enjoyed Coyne and feel like he’s been sharper than usual of late (since moving back to the National Post). For Americans, there may be some interesting lessons in here for the Tea Party movement. Canada experienced a much, much lighter form of conservative rebellion with creation of the Reform Party in the late 80s/early 90s which split off from establishment conservatives. Today, that group is now in power (rebranded) but Coyne assesses that much of what they do has been watered down. But not everything… to the next two articles! Sadly, Canada’s “Environment” Minister is spending most of his time attacking environmental groups. The charge is that they use US money to engage in advocacy against a pipeline to be built in Canada. Of course “Laundering” is a serious charge (in infers illegal activity) and given how quick the Conservatives have been in suing opponents for libel Kent had better be careful the stakeholders will adopt this tactic. Of course, this is probably why he doesn’t name any groups in particular (clever!). My advice, is that all the groups named by the Senate committee should sue him, then, to avoid the lawsuit he’d have to either a) back down from the claim altogether, or b) be specific about which group he is referring to to have the other suits thrown out. Next headline… to the double standard! Some nifty investigative work here by a local Vancouver reporter finds that while the Canadian government believes it is bad for environmental groups to receive US funds for advocacy, it is apparently, completely okay for Conservative groups to receive sums of up to $1.7M from US oil billionaires. Ethical Oil – another astro-turf pro-pipeline group does something similar. It receives money from Canadian law firms that represent benefiting American and Chinese oil interests. But that money is labelled “Canadian” because it is washed through Canadian law firms. Confused? You should be. I love that Clay Christiansen is on twitter. The Innovator’s Dilemma is a top 5 book of all time for me. Here is a great break down of how IKEA and Apple stores work. Most intriguing is the unique value proposition/framing their stores make to consumers which explains their phenomenal success as why they are often not imitated. This entry was posted in book review, canadian politics, commentary, cool links, public policy, random on May 4, 2012 by David Eaves. The Review I want to Read of "What Technology Wants"
A few weeks ago I finished “What Technology Wants” by Kevin Kelly. For those unfamiliar with Kelly (as I was) he was one of the co-founders of Wired magazine and sits on the board of the Long Now Foundation. What Technology Wants is a fascinating read – both attracting and repulsing me on several occasions. Often I find book reading to be a fairly binary experience – either I already (explicitly or intuitively) broadly agree with the thesis and the book is an exercise in validation and greater evidence, or I disagree, and the book pushes me to re-evaluate assumptions I have. More rare is a book which does both at the same time. For example, Kelly’s breakdown of the universe as a series of systems for moving around information so completely resonated with me. From DNA, to language, to written word, our world keeps getting filled with systems the transmit, share and remix more information faster. The way Kelly paints this universe is fascinating and thought provoking. In contrast, his determinist view of technology, that we are pre-ordained to make the next discovery and that, from a technological point of view, our history is already written and is just waiting to unwind, ran counter to so many of my values (a strong believer in free-will). It was as if the tech-tree from a game like Civilization actually got it all right – that technology had to be discovered in a preset order and that if we rewound the clock of history, it would (more or less) this aspect of it would play out the same. 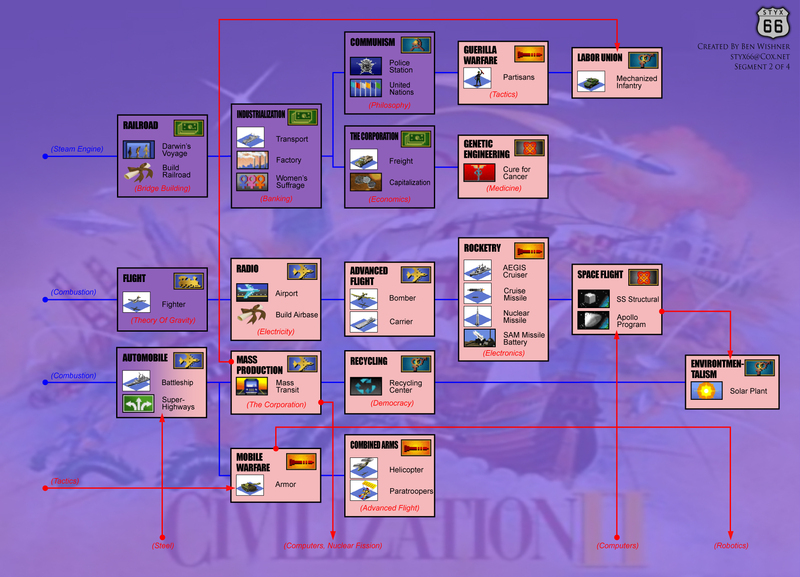 The tech tree is civilization always bothered me on a basic level – it challenged the notion that someone smart enough, with enough vision and imagination could have in a parallel universe, created a completely different technology tree in our history. I mean, Leonardo De Vinci drafted plans for helicopters, guns and tanks (among other things) in the 14th century? And yet, Kelly’s case is so compelling and with the simplest of arguments: No inventor ever sits around unworried that someone else is going to make the same discovery – quite the opposite, inventors know that a parallel discovery is inevitable, just a matter of time, and usually not that much time. Indeed, Kelly convinces me that the era of the unique idea, or the singular discovery may be over, in fact the whole thing was just an illusion created by the limits of time, space and capacity. Previously, it took time for ideas to spread, so they could appear to come from a single source, but in a world of instant communication, we increasingly see that ideas spring up simultaneously everywhere – an interest point given the arguments over patents and copyright. But what I’d really like to read is a feminist critique of What Technology Wants (if someone knows of one, please post it or send it to me). It’s not that I think that Kelly is sexist (there is nothing that suggests this is the case) it is just that the book reads like much of what comes out of the technology space – which sadly – tends to be dominated by men. Indeed, looking at the end of the book, Kelly thanks 49 thinkers and authors who took time to help him enhance his thesis, and the list is impressive including names such as Richard Dawkins, Chris Anderson, David Brin, and Paul Hawken. But I couldn’t help but notice only 2 of the 49 were obviously women (there may be, tops 4 women, who made the list). What Technology Wants is a great read, and I think, for me, the experience will be richer once I see how some other perspectives wrap their heads around its ideas. This entry was posted in book review, commentary, reviews on May 30, 2011 by David Eaves. Two weeks ago, after seeing Yellow Pages stacked, unused and unwanted in both my own and several friends apartment buildings, I started a Facebook Group entitled 100,000 Canadians who’ve opted out of yellow pages! In two weeks, with friends telling a friend here and there, we’ve grown to 1000 people. So where did this come from and where is it going? Well, for a number of years there have been petitions against Yellow Pages but obviously they have had little impact and, frankly, I suspect they actually garner few sign-ups. In Connected: How Your Friends’ Friends’ Friends Affect Everything You Feel, Think, and Do Christakis and Fowler show how people are more likely to vote when their friends, and friends’, friends voted. This suggests there is a strong social component to behaviour. Given that many people I talk to want to opt-out, I thought maybe people will be more likely to opt-out if they knew their friends and their friends, friends opt out. And maybe we could help create that cycle. Facebook, because it allows us to connect with our friends and share some online actions we take, felt like a great platform to do this. Indeed, it seemed to me exactly the ingredient that many online petitions (Which don’t allow you to socialize your activity) seemed to be missing. Also, surprisingly, there wasn’t already a Facebook group dedicated to this. 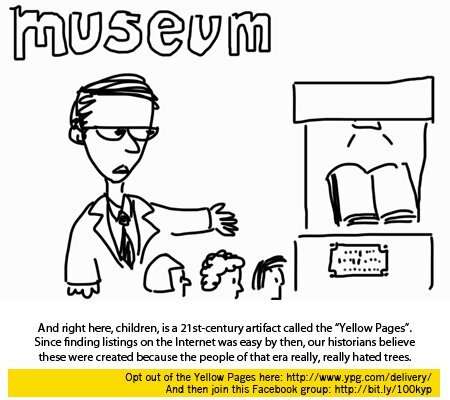 Indeed, looking at Yellow Pages own research reaffirmed my belief that such a group could be successful. They claim 61% of Canadians aged 18+ use their directories at least once a month to look up a business. (Interestingly you can’t read the report on which the claim is made). But (a) this felt unlikely and (b) once a month? So people use the yellow pages 12 times a year…? That’s not delivering value, indeed the number is so unimpressive and underwhelming that if that is the best they can offer, I’m sure we can find lots of Canadians who’d prefer to just say no. So how I have I structured this (admittedly) off the side of my computer and amateur-driven campaign? I’m trying to follow Clay Shirky’s three pieces of advice at the end of Here Comes Everybody . Make clear the promise, the tool and the bargain. The Promise: the thing that convinces a potential user to become an actual user. The promise of this Facebook group is: by taking a simple action and sharing it with our friends, we can save a lot of waste and not receive a large (and annoying) piece of spam in our mailbox. The goal here is to keep everything simple. Participating requires very little time, the impact is immediate (you stop receiving the yellow pages) but also can scale significantly (lots of yellow pages may never get printed). Indeed, an extreme possible outcome – should enough people join the group – is breaking the printed yellow pages business model. If a sufficient number of Canadians actually opted out of the yellow pages, it would be hard for advertisers to believe Yellow Pages marketing materials as probably several more million aren’t on facebook, haven’t joined the group, but also find it useless. But, I’m not holding my breath – for now, I’m happy even getting a few thousand people to opt out. The Tool: what will enable people to do what they actually want to do. In our case, it is opt out of receiving the yellow pages. So there are two key tools. The first, is Yellow Pages opt-out form. Indeed, this group exists because there’s failure in information distribution. In some ways the group is about socializing this tool that people find helpful. Most people I talk to think the Yellow Pages are a waste and wish they didn’t have to get them. The truth is, you can opt out of receiving them – it was just that nobody knows how. We are fixing that information gap. The second tool is a way to share the good news with others. Here, thanks to facebook, we leverage their tools, such as invites, status updates, people even upload photos of Yellow Pages siting unwanted in their apartment lobbies, share videos or – as in the case of Rob above – draw cartoons! An unanticipated tool has been people helping each other out with filling out the form, or giving feedback to Yellow Pages about their service. The Bargain: Helps clarify what you expect of others and what they can expect of you. The bargain for this group is possible most interesting. Since I believe the Yellow Pages is spam and that, frankly, no one likes getting unwanted emails here is the bargain I’ve crafted. Users will opt out of the yellow pages and, hopefully, tell a few friends about the group. As group owner, I promise to only reach out to the group 5 times. Once when the group size hits 1000, 5,000, 10,000, 25,000, and (if we are so lucky) 100,000! I don’t want people to feel burdened by this group – I want them to feel liberated, happy and rewarded. Moreover, people’s time is valuable… so not communicating with them is probably the best thing I can do – hence, the self-imposed limits that reflects milestones we can collectively feel proud of achieving. So without spamming our own networks we’ve gotten to 1000 people in two weeks. Fairly good growth. Will we hit 100,000? I don’t know. It is an ambitious goal. Will we break the Yellow Pages business model? Probably less likely. But can we save some trees and save ourselves the hassle of receiving some very bulky and unwanted mail. Yes. And maybe we can show that Canadians don’t use the Yellow Pages. Ultimately, though we can tell a company that the very people it claims to serve just think it is appalling that they spam an entire country with a 400 page book particularly in an era where, as far as I can tell, so few people actually use it. Oh, and I hope you’ll consider joining the group and telling a few friends. This entry was posted in book review, cool links, technology and tagged clay shirky, environmentalism, facebook, green, social networking sites, waste, yellow pages on July 5, 2010 by David Eaves. First, I’m away on vacation (hence the scarce number of posts) and am consumed writing a few chapters for a couple of books that I’m contributing to – more on those in the near future I hope. In the interim, I became profoundly depressed this morning after reading the passage below. I’m certain that history will look back at the Bush presidency as a “lost decade” when not only did the economy go off the rails and America’s standing in the world plummeted, but hundreds of thousands of lives were lost and billions were wasted in Iraq, human rights were hurled decades backwards and the benefits and progress of work in the humanities and sciences were put on hold (and in many cases, simply wasted). …According to an exhaustive examination of all of Florida’s ballots that several newspapers and academics conducted a year after the election-and whose findings were largely lost amid the coverage of the September 11th, 2001, terrorist attacks and utterly forgotten after Bush’s 2004 reelection-what determined who won the U.S. presidency was the infamous butterfly ballot that voters in Palm Beach county used to mark their choice for President. In Palm Beach County – a heavily Democratic enclave populated by tens of thousands of elderly Jewish voters – ultraconservative fringe candidate Pat Buchanan recieved 3,407 votes, three times as many votes as he did in any other county in the state. (According to one statistical analysis, if the voting pattern of the state’s other sixty-six counties had held in Palm Beach, Buchanan would have won only 603 votes.) What’s more, 5,237 Palm Beach County voters marked ballots for both Al Gore and Pat Buchanan, and therefore had their ballots invalidated. Bush carried the entire state by 537 votes. Less well known is the ballot in Duval County in which the presidential ballot showed five candidates on one page and another five candidates on the next page, along with instructions to “vote every page.” In that county, 7,162 Gore ballots were tossed out because voters selected two candidates for President. Had the instructions been clearer, Duval County, too, would have provided Gore the margin of victory. Design does matter. In this case, poor design costs America (and much of the world) a decade of progress and, possibly, countless billions (if not trillions). This entry was posted in book review, cool links, united states and tagged iraq, presidential elections, science on August 25, 2009 by David Eaves. Here, in this book about how progress is made in the sciences I was completely floored by this paragraph in penultimate chapter: The Resolution of Revolutions. This describes precisely how I feel about Public Service Sector Renewal (reforming the public service). When I talk and write about an open and networked government I understand it raises questions around accountability, ministerial responsibility and human resource management. I’m aware that these are “large problems” for which our present structure has some – albeit highly imperfect and I’d argue, quickly eroding – answers. Moreover it is true, that if we decided on how and if to reform government based solely on the performance of past models then we would always choose the status quo. The corporate hierarchy has served us well. Any new model will appear, relatively speaking, untested. But a growing number of us know that the status quo is unsustainable. I know that any new system, however slight the change, will bring with it new challenges and questions, but the paralyzing and untenable problems with the current system will ultimately outweigh these unknowns – even in an organization as conservative as the public service. Ultimately, I am saying that a new system can succeed with many large problems confronting it even as the old system has failed only with a few. So, as odd as it is to admit, I am, in part, acting on faith. Not only that, I believe the public service is going to learn to have faith as well. Why? Because in the end we won’t have a choice – the old problems this system cannot solve will demand it. We will have to change, and that will mean, someone, somewhere in the public service have put their foot forward into the unknown. This entry was posted in book review, public service sector renewal and tagged book review, canada, government, open, public service, public service sector, public service sector renewal, science on May 13, 2009 by David Eaves.